We offer Blue-White digital flowmeters, paddlewheel flowmeters, ultrasonic flow meters and rotameters for measuring flow rates. The new Blue White ultrasonic flowmeters have become very popular as there are no moving parts to wear out or get stuck with debris. 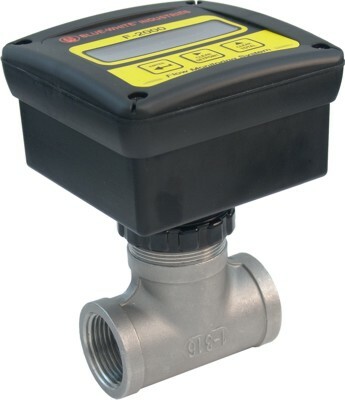 These flowmeters work on harmonic sound created by the flow of water through the pipe. Paddlewheel is the traditional method of measuring flowrate digitally. Rotameters are nice because they are easy to read visually and also have no moving parts to wear out. Note: All Flowmeter orders can be expidited using Fedex carrier service using (1, 2 or 3 day delivery methods) and be shipped the same day. Priority mail and Ground orders usually take 2-3 days in assembling before they are shipped out. Sonic-Pro™ has the ability to measure Fluid Flow using either Doppler or Transit Time methods and, unique to Sonic-Pro™, is a manual switch to toggle between Doppler and Transit Time methods. 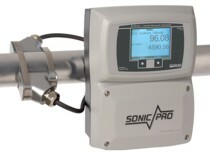 The ProSeries™ Sonic-Pro™ S1, Hybrid Ultrasonic Flowmeter, is a fundamental unit for systems with limited requirements.